How do you find the faces, edges, and vertices of any shape? I just go blank, because I really don't understand it. When I see a question that asks what the faces, edges, and vertices of a shape are I get really confused and then I stay on that question for the rest of the time we have to do the test. I really hope you can help me! You just have to know what the terms mean, and then count them. A face is a flat surface, like the front or top of a box. An edge is a line along which two faces come together. 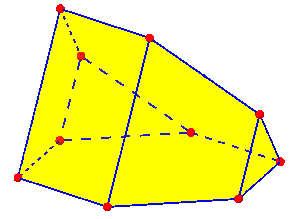 A vertex is a "point" on a shape, a corner where several faces (and edges) come together. Many students struggle with the word “vertex”, a Latin word whose plural is “vertices”, pronounced and spelled such that students think that the singular is “vertice”, or spell it “verticies”. Now, if you actually have the object in front of you, you can just count them all, making sure you count each thing once. On my box, you could count the four vertices on top, then turn it over and count four more vertices on the bottom, making a total of 8 vertices. You might have a physical object you can mark, to avoid over- or under-counting; or just hold it in such a way that you can tell what has been counted. Once you are really familiar with a shape, you can just imagine turning it around like this. But that can get hard for large objects, and is certainly hard when the shape is new to you. So by thinking about the parts that go into making the shape, I can break down the count into manageable parts without having to see them. Just don’t forget that the bottom is a face, too! I am currently teaching my 3rd graders about geometric figures. Every time we begin using the words edges, corners, and surfaces to describe geometric figures, my students get confused on how to determine an edge versus a corner. They also have difficulty counting the number of edges on a geometric figure, say a cube. Is there some good "not too over the head" vocabulary to help my students determine an edge versus a corner? 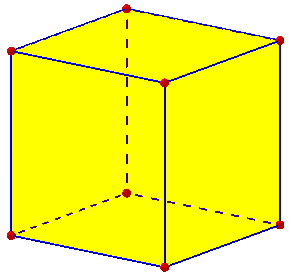 Can you explain how to calculate the correct number of edges on a cube? Thanks for your help. Part of the problem is that the word "corner" is ambiguous; we don't use it in math, and kids use it in too many ways to get a clear picture. The proper terms are vertex, edge, and face, where a vertex is a POINT where different faces come together, and an edge is a LINE (segment) where different faces come together. I can easily picture calling an edge a corner in everyday language, so I'm not surprised they get it wrong. A “corner” of a wall is an edge, while a “corner” of a table is a vertex. So while I appreciate the curriculum author’s concern not to overwhelm students, there really is no non-technical term that unambiguously says what we mean here. A teacher, required to teach poorly-chosen terms, just has to make the best of it, and I didn’t try to deal with that pedagogical question. If I were teaching that level, I think I might add words, calling a vertex a “corner point” and an edge an “edge line” for a while, then wean the students away from the extra “point” and “line” once the meanings were clear. I’ll be looking at possible reasons for the use of “surface” instead of “face” next week. Now, how can we count the edges of a cube? It's just a matter of finding an orderly way to keep track of them. You could make a cube out of paper, and mark each edge as you count it; or use erasable markers on a plastic one. Or you can set the cube on a table and count one group of edges at a time: there are four edges on the table, four on the top, and four standing vertically, making 12 in all. The fun way is to use the kind of tricks mathematicians like, which save work for large problems, while making use of the orderliness of a problem. You can look at each corner (excuse me, vertex) and count the number of edges there: 3 come together at each vertex. There are 8 vertices in all, and 3 times 8 gives 24. But that didn't count the number of edges, because we counted each edge twice - we really counted the ENDS of edges, and each edge has two ends. So we divide 24 by 2, and get the right answer. You can instead count the number of edges on each face; again, each edge will be counted twice, since it belongs to two faces. This kind of thinking is extremely useful, and seeing that all the different methods come out the same can be exciting, maybe even suspenseful! I often recommend to students not to stop with finding one way to solve a problem, but to try to find others. This gives additional practice in problem-solving, and also can help a student to discover what kind of thinking works best for her. The last two methods I suggested may not be suitable for everyone (even 12-year-old LaKesha from the first question), but could be good introductions to the ways we later make formulas for such counts. It can also be helpful to rename what you are counting. In the “vertex-first” method, what we are really counting is “edge-ends”. There are 3 of these at each of 8 vertices, for a total of 24 ends; and two ends make an edge, so there are 12 vertices. In the “face-first” method, we are counting “face-edges”: each of the 6 faces has 4 face-edges, for a total of 24; but two face-edges make an edge of the cube, so again we have 12. I didn’t talk about some of the really interesting polyhedra, so let’s try that. 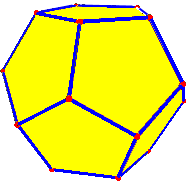 Take the regular dodecahedron, which consists of 12 pentagons. Obviously it has 12 faces; how many edges would it have? Each of 12 faces has 5 edges, for a total of 60 face-edges; each of those is shared by two faces, so there are 60/2 = 30 edges. As for vertices, we need to know that three edges (and three faces) come together at each vertex. So the number of vertices is 1/3 of the number of edge-ends, which in turn is twice the number of edges: there are \(30\times 2 \div 3 = 20\) vertices. If you have a picture, you could organize the counting the way I initially suggested. There are 5 edges on top, 5 going down from there, ten around the “equator”, then another 5 going down and 5 on the bottom, for a total of 5 + 5 + 10 + 5 + 5 = 30 again. And there are 5 vertices on top, 10 around the “equator” and 5 on the bottom, for a total of 20. Turning the tables: What is the shape? Now what if we reverse the question: given the numbers of vertices, edges, and faces, what shape is it? 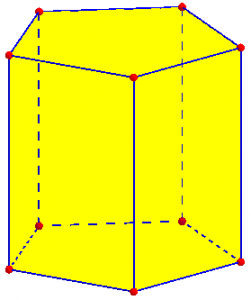 What is the name of the geometric solid having 7 faces, 10 vertices, and 15 edges? Thank you! A question like this will not have a single answer; most polyhedra have no special name, and most of those that do are defined by special features such as parallel edges or congruent faces, so they would not apply to the kind of general situation you are asking about. 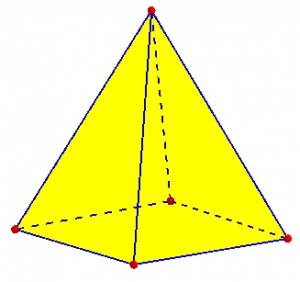 For example, if a prism has this number of faces, edges, and vertices, and you stretch the bottom, you can change it first to a frustum of a pyramid, and then to a nameless distorted prism, without changing the fact that it fits your description! Do the same for several other kinds of shapes (pyramids, perhaps regular polyhedra and some others), and see whether what you are given fits any of those. Alternatively, I could have suggested working backward from the specific numbers given, for each type. 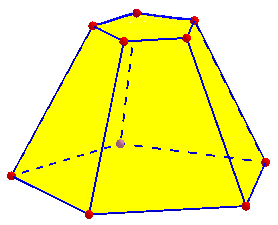 If is it a prism, then ignoring the top and bottom bases, there are 7 – 2 = 5 lateral faces, so it would have to be a pentagonal prism. That would, indeed, have 10 vertices (5 on top, 5 on the bottom), and 15 edges (5 on top, 5 on the bottom, and 5 on the sides). So this is the answer. If that had failed (say, there were 7 faces as before, but 7 vertices and 12 edges), we might next try for a pyramid. That has on face on the bottom and the rest (here, 6) on the sides, making it a hexagonal pyramid. And that would, indeed, have 7 vertices (6 on the base and one at the apex), and 12 edges (6 on the base and 6 on the sides). We are doing the Polyhedron Activity. I know the formula V+F-E = 2. Can you help me find the number of vertices and edges for the following polyhedra: heptahedron, nonahedron and decahedron? Polyhedra are very slippery things! The name, and the number of faces it implies, is not enough to fully determine what polyhedron you have. Now, Leo here mentioned a formula relating vertices, edges, and faces of any polyhedron. That is called Euler’s Polyhedral Formula (among other names), and will be the subject of my next post. Knowing the formula, if you know any two of F, E, and V, you can find the other; but knowing only one (in this question, F) is not enough to find the rest unless you have other information.